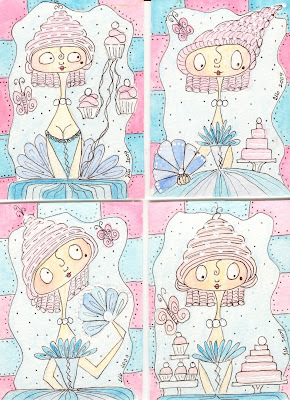 WHIMSICAL MARIE ANTOINETTE SWAP atcs for all group. Next hand-drawn swap that I'm doing on atcs for all is WHIMSY FAT GIRL LOVE , decided to do this one after I saw some photos on some blogs that I sometimes visit, made me realise that I shouldn't be ashamed of my form. I need to have the same courage and love for myself ....seems those galz do. Strange that some of us see ourselves as fat and others see themselves as thin. We are too obsessed with self image and what people see on the outside, we need to be stronger and let people see the person within,but for me there is also a problem with that !!!! The problem is on the outside you see as it is .....100% , within we can fake, someone can come across as something they are not and fool people. We don't only judge on body shape but also on the character of that person, shy, kind, extrovert, loud etc. and many a time we pass comments without knowing that person or by going on what other people say. Well to me it seems you can't win...............I suppose the most important thing is that you should like yourself because if you don't , who will !!! ciao Joan le tue whimsy marie-antoinette sono bellissime, sei proprio brava a disegnare!! io purtroppo sono negata quindi ammiro tanto chi ha questo dono! !